Most of the subjects in engineering involve complicated calculations and data management. In any engineering project, the related professionals work in groups with predetermined responsibility on each member of the group. These members continuously share important information and data that they work out through difficult mathematical processes. Mathcad is a computer software designed by the Parametric Technology Corporation(PTC) that helps the professional engineers to verify, validate and represent the engineering calculations efficiently. These software are mostly used by mechanical, electrical, civil, and chemical engineers. It not only eases the tough calculations but also helps these professionals to collaborate and share the information purposefully. In recent times, the popularity of Mathcad has increased manifold. Engineering students are often given relevant training on this software and many companies send their engineers to obtain professional training on Mathcad. Apart from regular lessons and on-field training programs, trainee students and professional engineers are often given Mathcad assignments. EssayCorp provides relevant Mathcad assignment help to the students who can't invest much time or don't have sufficient working knowledge to complete Mathcad assignments. We are the pioneers in this industry and have provided thousands of assignments on Mathcad to students and professional all over the world. Due to our prolonged experience with the subject, we are the perfect choice to get Mathcad assignment help. Assignments play a vital role in understanding Mathcad. Most of the students solve Mathcad problems with a lot of struggle, even then, they can’t complete the assignments satisfactorily. Students remain extremely busy with daily classes, training programs, case studies and other activities. Working professionals who are taking Mathcad classes are also hard pressed against time. Mathcad assignments are mainly interdisciplinary in nature. Use of Mathcad functions in the right scenario is also a challenge for the students. Smooth integration with PTC Creo - The users of PTC Creo 3.0 M030 have facility to embed a Prime 3.1 worksheet directly within the model they have created in Creo environment. The prime 3.1 worksheets can be handled within the model itself. This embedding makes the need to control and support two separate files redundantly. Smoothly integrates with 3rd party tools - Mathcad Prime 3.1 provides connectivity to the 3rd party tools like Prode's physical properties, CoolProp's fluid properties, or ODBC-compliant database. Moreover, the users can handle HDF5 file format, export PTC Mathcad matrices to C++ code, or export mathematical algorithms to use CAD surfaces though DXF, STL, or IBL setups. Math in text - Users can insert live math, and move that inserted part anywhere within the text. This helps the user to improve the presentation process. Custom functions - Mathcad Prime 3.1 are loaded with hundreds of inbuilt functions that cover all the major niches in mathematical engineering. With the help of custom functions facility, the user can write and integrate their own functions, thereby customizing his working environment to meet his fundamental engineering needs. Protection against possible thefts – Mathcad gateway helps to control engineering calculations of a professional or organization while floating certain parts of it for everyone's use. To get the best assignment on this subject approach our Mathcad assignment help service. Access from anywhere – Being a cloud-based software, the group of engineers could access and work on their respective parts from anywhere. Certified calculation hub – It's a unique feature that helps the user to standardize on calculation best practices. Our writers provide solutions for all the versions of Mathcad; all you need to do is approach our Mathcad assignment help service. Appropriate and reliable outcomes – There was a time when engineers and the groups spent a lot of time in searching for the accurate certified calculations. Mathcad gateway provides a sole point of entry to all the best practices in calculations. Here are the most common mathematical topics that are frequently used by engineers and also incorporated in Mathcad assignment help. Vectors and matrices - It includes topics like linear algebra, matrix and its properties including using matrix toolbar, range variables, copy and paste, etc. Graphing - It includes plotting expressions, functions, and matrices of data on the same plot, use undefined variables or vector data for independent variable, etc. 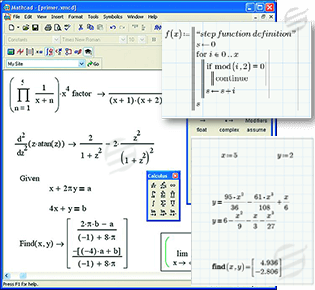 Calculus - It includes differential and integral calculus, differential equations and application of symbolic toolbars, etc. Data Analysis - It includes interpolation and curve fittings. Functions - It includes user defined functions and intrinsic functions, if functions and Boolean operators, etc. Our writers provide help with many other topics in our Mathcad assignment help service. EssayCorp is the most excellent site to seek assignment help from. They have such excellent writers. When it comes to quality, EssayCorp is best among all. You guys made it so easy for me to crack this semester. I'm highly satisfied with the work. EssayCorp provides the most useful and relevant content. You saved my grades guys. The best thing about EssayCorp is, there is 24*7 online availability for queries and bookings. I got my assignment written by such great writers and that too at a very low cost. Truly blessed to get in touch with EssayCorp.